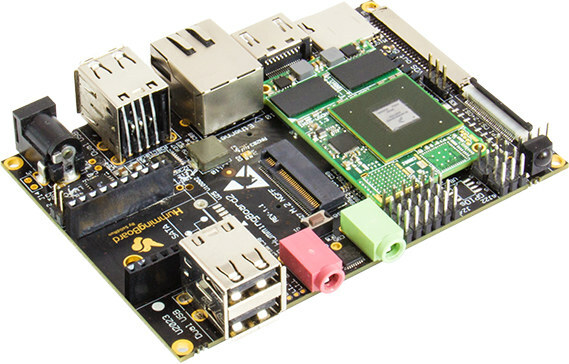 SolidRun launched its HummingBoard family last year with a board with a form factor similar to the Raspberry Pi, but instead of using a Broadcom processor, the boards were based on Freescale i.MX6 single, dual or quad core processors. The company has recently introduce a higher end board with Hummingboard Edge that adds an M.2 connector, eMMC flash, 7 to 36V DC power input, more camera interfaces, a DSI interface, and more GPIOs. The following comparison table shows the differences between the new Hummingboard Edge, and the older HummingBoard Pro and Base boards. * Gigabit Ethernet port, but limited to 470 Mbps (i.MX6 design limitation). The Edge board however loses the optical S/PDIF port found in the older models, is bigger, and supports Linux, but for some reasons not Android. The full list of supported OS can be found on the download page, although it’s not clearly at this stage which ones will run on HummingBoard Edge. A metal enclosure has also been designed for the board. HummingBoard Edge can be pre-ordered now for $102 to $252 depending on options, with shipping scheduled for the end of August. $102 will get you the baseboard with MicroSOM i1 module with i.MX6 Solo and 512MB RAM, but no power supply, no enclosure, and no wireless connectivity. The most expensive model will come with MicroSoM i4x4 with i.MX6 Quad, 4GB RAM, a Wi-Fi & Bluetooth Module, a power adapter, an 8GB micro SD card, and the metal enclosure. Visit HummingBoard product page for more details, and access to full documentation. Why would I choose this board over Inforce 6540 (http://www.inforcecomputing.com/products/single-board-computers/6540-single-board-computer-sbc) which has similar specs, but at least 4X more powerful CPU? Is it a real sata controller? Yes. The dual and quad versions of the processor support SATA. nice nice…but nowadays i.MX6 is too old. It’s twice the price so hardly comparable. If you order this board i.mx6-quad and 2 gb of ram, the price becomes 207.00 USD. Inforce 6540 costs 240 USD, with SATA port, onboard WiFi/BT/GbE/SATA/GPS, Snapdragon 805 SOC with Adreno 420 GPU and 4K HEVC decode, which is much more powerful than i.mx6-quad. I would definitely choose Inforce 6540. This is a open source hardware and firmware !